pp. 255, soft cover, DKK: 248, - illstr., facsims., maps, plans. There are many gaps in the biblical narrative about Moses. He enters the story, disappears again, - in return for resuming his leading role in the Israelite exodus story. The pattern repeating several times and the Books of Moses pay only little attention to these "quiet years". Only a few scattered hints show that there actually is a coherent story; and by the kind of theological method, which is currently in high esteem among a Danish school of research on the Old Testament, the people behind this line are inclined to disclaim these hints from having any research value. The so-called "Copenhagen School" of theology apparently do not attach any importance to Moses as historical person but will preferably consider him as a mythological common denominator - a literary product created to hold together the history that began in Egypt and ended in the promised Country. The question is whether it is valid to reduce the person Moses to a myth. The question also is whether it is tenable to simply ignore (or even ridicule) the attempts made from time to time placing the person Moses into an actually historical context. However, this is what so far has been done, condescendingly, to a non-theological writer who has dared to plough a few solid furrows in an arable land which the theologians prefer to forget as a fallow field. If a theologian have to shake himself in the cool atmosphere currently dominating upon the theological mountain, and he then read in an impressive work, which in these years is under publication, it will function as a breath of fresh air from more comfortable places. The first two volume were reviewed in this magazine, No. 191 (May 2001) and also in the Vicars' Journal 2001/50. A third volume of the author is now published, and it is also no less fascinating reading. The author Ove von Spaeth writes currently on a so-called interdisciplinary work in five volumes about the historical Moses. Since the author is not a theologian he feels he is not in any way bound by the restrictions that today's theological trend has imposed on itself. He has set himself the task of identifying the historical traces of Moses which necessarily must have been set, primarily in Egypt, - tracks that are only slightly visible in the biblical transmission and almost blurred elsewhere. The result that came out is a work exciting as a historical novel. The books, however, are much more than novels. Each feature being dealt with is supported with references to contemporary sources of a variety of different nature. Some of these sources are generally known, others not; but it is probably the first time that someone has undertaken to compare these sources and elicit from them a picture of a person whom the biblical writers only highlights as to the extent where he is entering into the superior account concerning the Israelite migrations. The present Volume 3 primarily deals with the periods of Moses' life - from when he (for reasons explained in the previous volumes) was forced away from Pharaoh's court, and up to the crucial time when he placed himself at the head of the Israelite refugees. But also some noteworthy events from the Israelite journey through the desert is highlighted while the Bible's "the Books of Moses" have put emphasis on many other things than to illustrate the direct historical context. Apparently the Pentateuch (Books of Moses) present us with a picture of a crowd of subdued slaves fleeing from their persecutors. But there is no viable explanation of how such a crowd of slaves was able to leave Egypt, armed as an army, and it can also surprise that among these refugees could be found enough costly goods to produce a golden calf in the desert. The Pentateuch shows no interest in giving us the answers to these questions, and precisely why it is so exciting to read this new attempt to answer these and many other puzzles by means of history and with the support of contemporary texts. Moses was travelling widely during this period. His personality may be the main key to some hitherto obscure detail in the traditional accounts about the wars which in these years kept the Egyptian army heavily occupied by turns by the country's northern and southern borders. Read! It is very exciting all. We know from the summaries of the previous volumes, that critical expert theologians have felt immensely offended that a non-theologian venturing into their territory and observes contexts to which they themselves did not connect with any importance. Be it as it may. It will be a free choice for a reader either to read the work with the scientific glasses (or blinkers) or whether he will by impulse find it interesting to see how a shadow-like figure from the Old Testament turns into a human being of flesh and blood and emerges as one of the major figures in world history. On the web: http://www.Moses-Egypt.net more can read about the work. "The Vanished Successor" (2001, C.A. Reitzel publishers) from the same author's book-series: "Assassinating Moses", 1-5" - the first two ones are: "The Suppressed Record" (1999) and "The Enigmatic Son of Pharaoh's Daughter" (2000). Biblical drama in exciting new light. Ove von Spaeth's books point to the remarkable fact that already in early Antiquity it was consistently tried - under an ongoing struggle for power - to delete all Egyptian traces of Moses. Moses! It sounds somewhat dusty! A bit obsolete. Smells almost like the village school with stanza of a hymn and catechism and the Old Testament. And the Law of Moses. Moses at the Red Sea. The Emigration from Egypt. It has been - and is - neglected that according to the latest research, Moses was a historical person and not only an element in a more religious context - but was perhaps also a somewhat goal-directed "struggler for power". This is what, for instance, Professor F.J. Billeskov Jansen called him recently, when he was a reviewing the Danish researcher, Ove von Spaeth's new, informing book on Moses, i.e. "The Vanished Successor" (C.A. Reitzel Publishers). Quite a lot is actually speaking in favour of connecting Moses directly to the foundation of a nation. This makes him something else and more than a person with only a place in religious connection. This also makes him an important historic person - and by this, his own history becomes obviously interesting also to us in our new millennium. However - at present within some research areas, it is disputed if the said historical event in the Bible is at all historical. And many will not recognize that it is possible, further on, to displaying essential news about Moses. But with "The Vanished Successor" Ove von Spaeth presents a number of exciting and often re-examined sources pointing to circumstances in connection with the oldest known historic sequence resulting in the formation of a genuinely constituted state. The evaluated material is so comprehensive, and Ove von Spaeth's work so thoroughly done that it is scientifically unacceptable only to look down the nose and snap, "No good" - only because it does not fit in with the customary. And facing the question, "Why did these things happen at that time", von Spaeth's often exceptional material demonstrates a surprising plausibility behind the biblical narrative. During this new book the reader is left with an increasing feeling that Ove von Spaeth's narrative has opened up to a number of elements, which are also being contemporary. The entire upheaval, the struggles for power, and Moses's escape from the court and Egypt are interesting in more than the classical context. The pre-Greek culture - and also the border districts of Egypt - went through a very violent period - all in the years of ca. 1450-1350 B.C. It corresponds very close with the life of Moses. With Crete as a kind of a junction point and here the Knossos Palace as the physical center, there was a considerable mutual cultural influence between parts of the Greek cultural territory and Egypt. The Cretan-Minoan culture (the Period of the Bull Horn) with the open Cretan society, terminated completely around 1400 B.C..
On stage can also be seen a probably Canaanitic sea-going people appearing, i.e. the Danas or the Danites - known from the Bible - who was previous neighbours to the Philistines in many Mediterranean locations, and the book presents a number of new, interesting information on these. It is fascinating to see how many customs - direct or adapted by later Christian culture - we have originally taken over from this early period, of which especially Moses in many respects is to be found in its centre. Another example is the wandering in the wilderness - also known as the Exodus. Researchers have doubts as to whether the Moses and Israelite agelong stay in the desert was realistic. However, modern times have seen a similar example, to which the book refers: In China when Mao Ze Dong and his huge groups of troops hostile to the government, made, together with their families, the "Long March" from 1934-1935 and further on. This long march was in fact not terminated until 1949 by the actual taking over of power at the Chinese mainland - like "the Promised Land". Everywhere in the old world and all along to recent times it was quite normal, that groups of people with different languages, religions, and cultures, were ruled by a foreign grand sovereign. Often they felt happy that way because of the many practical advantages. The conception in our understanding of nationalism as such belongs to recent times. However, already in connection with the biblical Israelites, the idea has a special perspective, which in itself may prove more historically relevant to us than, for instance, research so far has made us understand. It is suggestive how in several ways, von Spaeth's analysis is knocking holes in many researchers' hypotheses about the so-called lack of historical validity of the biblical narrative concerning Moses. This becomes obvious because the analysis is throughout logical during its step-by-step method - and because all the time von Spaeth is working with an extremely minute documentation. It is also suggestive that several parts of the claimed myth about Moses is deeply rooted in Egyptian factual history - and thus seems to prove being much more than a myth, at least as far as a number of solid historical details are concerned. Ove von Spaeth's interdisciplinary dialogue with the broad spectrum of documentation in the book is exciting - also as a separated reading. Of course it is inviting for attacks, which is characteristic to all good research. But at the same time it has caused that many interesting but often forgotten and neglected documents have been brought to light, and now they will be subjected to the advances of contemporary research. But to our academic establishment, or establishments, all this is not done without impunity. It is an interesting phenomenon to watch from the very beginning, how the work of this researcher has been exposed to a convenient non-specific criticism, because he is dissociating himself from the prevailing "political correctness" within certain comprehensions by the traditional research. Ove von Spaeth has substantiated his work about Moses by hundreds of sources supplemented by a veritable deluge of specific examples. In this connection he is seen being accused of erroneous use of sources, often because of several academic critics' obvious lack of counter-arguments. But, as is to be seen, he only proceeds in a different way, in particular when - unprejudiced and in advance - he avoids to neglect what may seem to be strange and mystic sources and, instead, first examine whether relations of the source's narrative could at all have been carried out in historical practise. (See for instance below, Exodus being "tested" military-historically). Only when a result seems reasonable he let it form the basis for going at least one step further in the continued examination of the source. Well known and highly respected researchers have always done so. So why not this researcher? 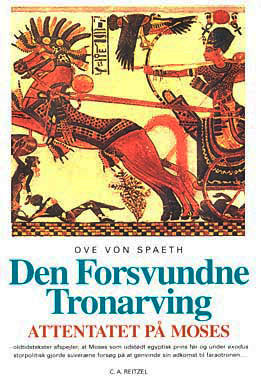 Ove von Spaeth's book on "The Vanished Successor" has the elaborating subtitle, "Ancient texts reflect how Moses as an expelled Egyptian prince brilliantly exploited the historic Middle East tensions by enduring attempts to regain his claim to the throne of the pharaohs". The context tells us that Moses, the disappeared heir to the throne, by a coup was being expelled from the Egyptian throne, to which he is said both to have be born and originally recognized - according to old Jewish sources and a number of ancient writers. Again, controllable, exact details of these narratives seem to show the likelihood of this rather than just mythic stuff. And we are being presented for several ancient texts revealing that the exiled Moses for a long time was pulling political strings in order to regain his rights to the throne. Then a decisive upheaval was instigated by means of the Hebrew emigrant groups in Egypt - however, the result forced the Hebrew/Israelite people to look out for other pastures. Once more, parallel to information from many ancient historians, the book points out very precisely one of Egypt's toughest war kings, i.e. Pharaoh Amenhotep II - the "tough Pharaoh" of the Bible - who with military power tried to interfere the emigrating of Moses and the Israelites. This proves to be in correspondence with the 15th century BC. A detail of great importance appears for the first time and is analyzed by Ove von Spaeth. The Bible's statement that at the start of Israelite exodus from Egypt "all the Egyptians' first-born were killed" is well-known - and by the knowledge of the Bible story when being spread in Europe through 2,000 years it became a solid cliché that a violent mass murdering of children had taken place. However, von Spaeth demonstrates that the "first born" in all ancient tradition was, normally, the senior elder of the families. Thus, the Israelites optained both an effectively minimizing of battles and killing, and at the same time a more unfettered marching off thus made possible by only eliminating the Egyptians' leaders and keypersons, which initially paralyzed the Egyptians' counteracting effectively. For the first time ever - and in the same time this topic it is an almost brilliant trait in this book - a true military-historical analysis is carried out on the emigration from Egypt and the invasion in Canaan. This was hitherto being neglected but ought to have been an important matter, of course, in previous research. And - contrary to recent theological theories - the event as such and the specific details are proved to be both possible and likely! A modern myth created only by present researchers has designated Tuthmosis III - the predecessor of Amenhotep II - the "Napoleon of Antiquity". However, surprisingly and again as the first, von Spaeth substantiates by documentation - even based upon Tuthmosis and his generals' own inscriptions, e.g. about the geography - that this idea is contrary to the neglected fact that this pharaoh never have extended the Egyptian empire even with one inch. But instead he only (although very well) defended its vast borders. A number of interesting information brought to light by von Spaeth's material seem to reveal that on Tuthmosis III's many expeditions, literally and with mathematical precision, this pharaoh and his army were restlessly bundled around for 19 years. And in addition according to complete context, this could systematically have been provoked by Moses (from his exile, at that early stage) together with many of his important allies especially from Canaan. On the background of such relations, thus as far as they can be reliable, the book shows able to present the key to disclosure of the "forgotten war". This, being the case, may lift a corner of the veil which had covered Moses' dramatic part acting in Egypt and the neighbouring countries: expeditions causing changes in the Middle East - thus changing the background for our understanding of the early history. Moses is being called the architect of the Israelite nation. And with the material presented, very much speaks in favour of this. Again, it is confirming Moses being a historically important person and personality. Ove von Spaeth's books present the significant fact that already in Antiquity - here as part of an ongoing struggle for power - it was tried to delete all Egyptian traces of Moses. And once again we recognise that this is what we so often see today. As a rule we ought to remember that history is always written by the victor (just think of history books of the Soviet Union, until Gorbatjev took over. Eventually the examination for the General Certificate of Education, Advanced Level, had to be cancelled at Russian Grammar Schools, because the history writing was thoroughly falsified). Also this present volume is enthralling - and communicated with a contagious engagement. A true resource of research studies performed with rare insight and qualified understanding. Ove von Spaeth's entire work, which is of great international calibre and qualifications, is also the so far most thorough, constructive, and comprehensive presentation of Moses. (additional information, see also www.moses-egypt.net ). Naturally, some researchers may in some cases look at the presentation with reservations. And the news in the book is being presented for testing with a broad audience. Simultaneously, the work should be given an open welcome with its radical, new, informing research. Only through openness knowledge is achieved. And only through knowledge is the platform being created for understanding, permissiveness - and awareness of us and our society. (Jens Jorgensen, MA Historian, former Examiner of History at the Universities of Copenhagen, Aarhus, and Odense, and Headmaster of Slagelse College/High School; for several years he was also a Member of Parliament, the Conservative Party's Spokesman on Educational subjects). Info: Ove von Spaeth: "The Vanished Successor" - (Assassinating Moses, vol. 3), C.A. Reitzel Publishers, 255 pages, illustr., 248 kr.